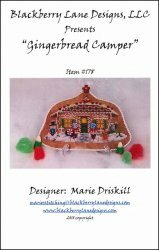 Gingerbread Camper Ornament [C7169] - $13.00 : Yarn Tree, Your wholesale source for cross stitch supplies. A cross stitch pattern by Blackberry Lane Designs. This camper is ready for Christmas! A snowman is standing out front with snow blanketing the ground. Candy canes line the entrance into the camper. Stitch count 82w x 46h.